This 7-week program designed specifically to help candidates prepare for the United States Army Special Forces Readiness Evaluation. 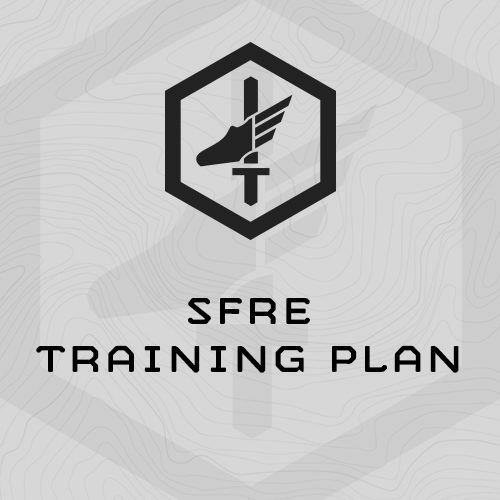 SFRE is a 3-day assessment conducted on a drill weekend for reservists, and serves as a precursor to Special Forces Assessment Selection. Candidates must pass this evaluation conducted Reserve Special Forces units prior to attending SFAS and entering the SF training pipeline. This plan is a culmination of all available open-source information and draws from our ruck based and mini-event programming theory that we have successfully implemented in past programs. It is designed with an emphasis placed on improving your endurance, stamina, rucking ability, and mental fitness. Week 7 in this plan is a taper/unload week – and the plan is designed to be completed directly before your SFRE. This training plan includes specific programming for the APFT, focused heavy rucking work, extensive running, work-capacity smoke sessions and long weekend mini-events. It is an intense training program which reflects the physical demands and intensity of SFRE. Tuesdays: 2-a-Day – Heavy Ruck Intervals in the AM. Run intervals in the PM. Course of known distances or GPS enabled devise to measure distances. A GPS will make your running and rucking interval distances and paces much easier to track. We recommend a Garmin Forerunner 15. 35% of Max Push-ups from APFT+ No. 2 Score. 35% of Max Sit-ups from APFT+ No. 2 Score. 35% of Max Pull-ups from APFT+ No. 2 Score. 40% of Max Push-ups from APFT+ No. 2 Score. 40% of Max Sit-ups from APFT+ No. 2 Score. 40% of Max Pull-ups from APFT+ No. 2 Score. "I just complete the Best Warrior for the state of Arkansas utilizing your SFRE program. I won the competition and after the last event within 10mins felt like I could complete another event if I had to! Thanks to you guys for the program !"